Littlest Sweet Shop: Commission update. Plus, new sets now available at Tiny Frock Shop! Commission update. Plus, new sets now available at Tiny Frock Shop! 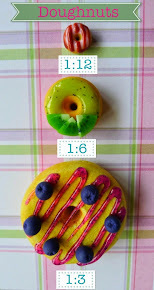 We made the cutest 1:3 scale doughnuts for a Littlest Sweet Shopper in Belgium. The pink ones are inspired by Homer Simpson's favourite doughnut. The Chocolate and peanuts is my own all time favourite doughnut! I would also like to remind all Littlest Sweet Shoppers that our exclusive sets are now available at Tiny Frock Shop (based in America). All of the sets are bespoke (one-of-a-kind!) and exclusive to this retailer. But hurry because we sold out 7 out of the 9 sets within just 2 days!!! Click the banner above for more information. 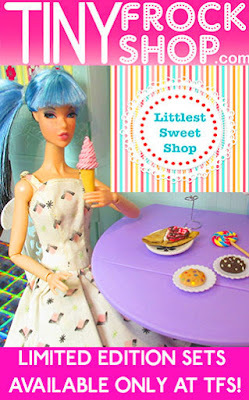 Tiny Frock Shop owner even did a video on ALL of the items in our new sets! She shows viewers how detailed every piece is so make sure you give it a thumbs up to encourage more videos like these. We will debut so many new miniatures for July very soon including new ice cream, waffle cones, tons of Japanese snacks, and more!! Make sure you visit us often and remember to follow us on social media to get the latest news first!